We can configure, support and break down your wireless network, but before we work with you, we need to see what you are working with. That’s why, when it comes to choosing among wireless site survey companies, it is crucial to pick the one which begins wireless network installation process with a professional wireless site survey. Do I Need a Professional Wireless Site Survey? A wireless, or WiFi, site survey provides insight into the unique benefits and challenges your location presents prior to us providing a recommendation for equipment and installation. A site survey will help us determine the exact number and placement of APs to provide ideal signal coverage, throughput and performance in your office, home, warehouse or event space. The length of a wireless site survey depends on the size and installation requirements of the location. Smaller locations like studio apartments or single room offices often to not require an active site survey, as a single access point (AP) placed just about anywhere will provide satisfactory wireless coverage. WiFi site surveys allow our engineers to prepare accordingly and plan for work ahead. A concrete plan cuts installation costs, expedites project completion and ensures a smooth and successful delivery. Learn more about wireless site surveys in our blog post – How Much Does A Wireless Site Survey Cost And Is It Worth It For My Business? Proper AP placement and channel selection is the key to configuring a flawless wireless network. Before we place APs and choose channels, our wireless experts need to make sure that the internal wireless network does not interfere with itself, let alone external wireless networks whose signals infiltrate your space and impact your network. A site survey helps us determine the AP placement and channel strategy that will result in the best wireless coverage and performance. We’ve seen hundreds of offices, warehouse, event spaces and homes where alternative service providers oversold or undersold wireless network equipment in an effort to meet their client’s wireless network needs. Intentions may have been good, but expertise was lacking. Made By WiFi is not here to take the place of your existing IT team. Our place is by your side, surveying your location, understanding your wireless network needs, installing your network and configuring everything within your existing IP infrastructure. Venues may differ, but Made By WiFi’s wireless site survey process follows 8 steps that consistently lead to peak network performance. Communication is key. Before we look around the venue, we listen. Customers tell us what they want in a wireless network as well as the type of equipment the WiFi network is intended to support. We discuss any shortcomings of the current infrastructure and begin working to bring your network goals to fruition. Though we do not require that clients develop a floor plan, we recommend it. 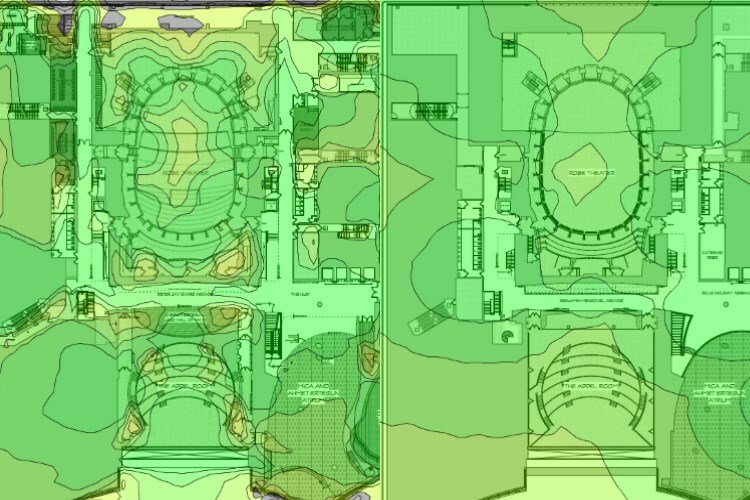 If you have a floor plan, we can develop a free heatmap for you that illustrates how wireless APs will perform in your environment. We are even able to adjust heatmaps to display the impact that structures such as walls, furniture and inventory have on signal strength. Site visits are typically conducted by two engineers who require access to all locations that will need wireless connectivity. This step helps us locate any items that impact wireless network performance that wouldn’t be seen on a floor plan. During the site survey, we discuss any aesthetic concerns and installation requirements that are unique to the space. Our wireless site surveys are non-intrusive and we go out of our way to make customers as comfortable as possible. To minimize workflow disruption, we can perform wireless site surveys on nights and weekends. Made By WiFi wants to save you money. We like to review your existing network equipment to determine if anything can be salvaged and incorporated into your new network. Oftentimes APs and mounting locations are the main culprits, while items like firewalls, switches, patch panels and more can still be used. We will advise on which equipment you can keep and which needs to be replaced in order to achieve your desired wireless coverage. Once we understand your network equipment and your layout, we discuss your desired coverage areas. There are certain locations where wireless connectivity is mission critical and others where it is a bonus. For example, workstations and offices usually need better coverage than rest rooms or closets. At this stage, we like to present different AP models and tell you how each will perform in your particular environment. We conduct a quick second walkthrough to establish equipment locations. These are sites to mount APs, switches, controllers, gateways and firewalls. We consider the cabling and power needs of each location as well as any surrounding structures that may impact radio signal performance. Our technicians hold a brief conference to discuss the plan and conduct a final walkthrough to confirm the installation locations and requirements. The lead engineer quickly marks locations on a floor plan or facility diagram. Once every location has been documented and approved, we go back to the lab to develop your heatmap and wireless site survey report. The site survey report recaps our findings and provides recommendations on equipment and installation locations. Remember the floor plan you provided? We return it as a heat map, highlighting access point locations and radio signal strength based on your space’s unique structural environment. A staple of every site survey, the heat map can be used as a guide for future wireless network installations. Whenever we perform an active wireless site survey, we test existing equipment as well as APs that we bring on-site to help you understand the performance differences. This helps us determine how well our signal measuring device can hear the signal from the closest wireless AP. A failing grade is usually the first indicator of an underperforming wireless AP. Objects like metals, wood, water, or even microwaves will decrease dBm and worsen wireless signal performance. This tests the strength of a radio signal relative to the performance of other radio signals and the channels that they use. In locations like offices, apartments and warehouse, we often see congested environments with many wireless networks broadcast in a very small area. The key is to find an available channel to reduce competing noise. Many of the APs we recommend will perform this task automatically, no operator intervention necessary. Some locations may not be a fit for an active site survey. If we’re not able to send engineers on- site or budget and time simply don’t allow for it, hope is not lost. We can perform a predictive site survey to figure-out access locations and potential network signal strength. Predictive site surveys are exactly that. Once our engineers visit your site to complete the wireless network installation, the requirements and equipment mounting locations may change. Wondering whether your location requires an active or predictive site survey? Check-out the comparison chart below. Our talented team of engineers has seen it all. Our site survey and detailed wireless report will empower you to take the next steps in building-out your wireless network. We deliver all of our findings in industry standard format and our reports can be used by alternative providers, if you choose to take that route. Contact us to schedule your no-obligation site survey today.